For full-frame shooters, a fixed f/2.8 aperture, 70-200mm zoom is an extremely popular lens for shooting sports, wildlife, reportage, events, weddings as well as portraits, making it a versatile and must-have lens for many pros. The Sony lens promises outstanding resolution, as well as attractive bokeh thanks to its eleven-bladed circular aperture. The Sony FE 70-200mm f/2.8 features no fewer than 23 elements, including three aspherical lenses, two super ED glass, and four standard ED glass elements. These are arranged in a a sealed dust- and moisture-resistant lens barrel, together with a fluorine-coated front element for extra protection in harsh conditions. Dual autofocus motors, including Sony’s SSM (Supersonic Wave Motor) and a double-sided linear motor that controls the rear group of elements, promise powerful autofocus operation despite the large number of elements. Additional autofocus controls include an AF/MF switch, focus lock buttons on the lens barrel to lock focus at a specific distance, and a focus limiter to reduce unnecessary focus hunting, all of which should help improve operation in fast-paced environments. Sony’s lens-based Optical Steady Shot (OSS) image stabilization system provides camera shake correction on all Sony mirrorless cameras, and Sony’s 5-axis image stabilization system also comes into play when used with cameras such as the a7R II. OSS on the Sony FE 70-200mm f/2.8 features two modes, including “Mode 2,” which corrects only vertical camera movement for better performance on panning shots. Additional features include an internal focusing system, a 77mm filter thread for attaching filters, and a rotating and removable tripod collar. An E-mount lens, the Sony FE 70-200mm f/2.8 is compatible with Sony APS-C mirrorless cameras such as the Sony A6500, on which it provides an equivalent 105-300mm focal length (taking into account the APS-C crop factor). 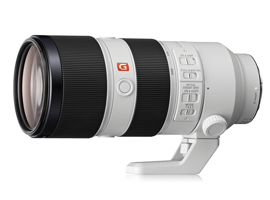 The Sony G Master FE 70-200mm f/2.8 telephoto zoom achieves an outstanding overall score of 39 points on the a7R II, thanks to its excellent 2.9 TStop light transmission that facilitates good low-light performance. It is the top-performing zoom lens we’ve tested on the a7R II, as well as the fourth-sharpest FE-mount lens overall among both zoom and prime lenses. Sharpness is phenomenal, scoring 38 P-Mpix and realizing almost all of the a7R II’s 42Mp sensor resolution. At f/2.8 (a crucial aperture on a lens of this type), resolution is uniform, with high levels of acutance between 70% and 80% recorded from 100 to 200mm. At 70mm f/2.8, edges are slightly softer than the center, but are still very respectable. The lens achieves peak sharpness of over 80% acutance in the field using apertures between f/4 and f/8 at focal lengths of 100–200mm. Some noticeable vignetting of over –1EV occurs when using the maximum f/2.8 aperture at all focal lengths (particularly the longer focal lengths), but the issue is significantly improved after closing down a stop to f/4, and is all but eradicated from f/5.6 onwards. Distortion is well-controlled for a lens of this type, ranging between 0.6% barrel distortion at 70mm to –0.6% pincushioning at 200mm, all of which would benefit from some correction for perfectly straight lines when shooting at the extremes of the focal range. Chromatic aberrations are also well-handled at most settings; and although some fringing is evident using all apertures at 200mm, it’s restricted to the far corners and thus shouldn’t have too big an impact on your images. 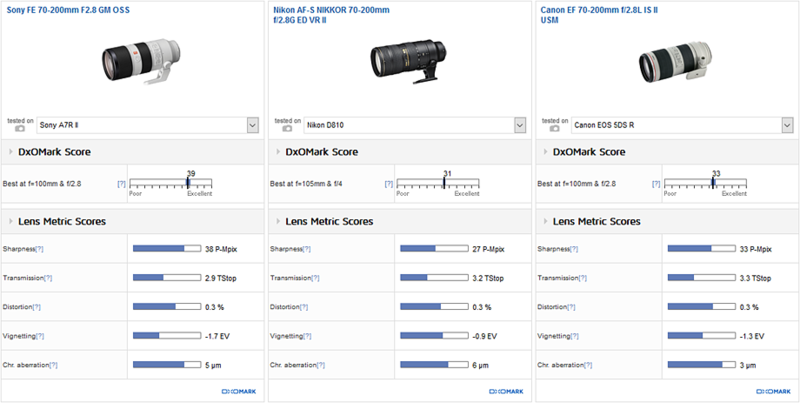 If we compare the Sony FE 70-200mm f/2.8 to the equivalent Nikon and Canon f/2.8 telephoto zooms tested on their respective highest-resolution DSLRs, we see that the Sony comes out top for low-light performance, light transmission, and sharpness. In fact, it’s significantly ahead overall for sharpness, not only producing the greatest sharpness at 38 P-M pix, but also realizing a significantly higher percentage (90%)of the camera’s sensor resolution. This compares to 75% for the Nikkor 70-200mm f/2.8G II on the Nikon D810 (27 P-Mpix / 36Mp resolution) and 66% for the Canon 70-200mm f/2.8L II on the 5DS R (33 P-Mpix / 50 Mp resolution). In terms of acutance in the field at the crucial f/2.8 aperture, all three setups offer excellent center sharpness at 70mm, with the Canon lens offering the sharpest outer field results. At 200mm f/2.8, all three lenses provide excellent uniform resolution, but the Sony FE 70-200mm f/2.8 is marginally the best, with over 80% acutance. Distortion is broadly similar between the three, with slightly less barrelling evident on the Nikon 70-200mm f/2.8G II at 70mm; and although the Nikkor starts to pincushion a little sooner than the Sony and Canon alternatives, they’re roughly the same by 200mm. The advent of super high-resolution camera sensors demands new lenses with phenomenal resolving power to maximize their potential. The range of FE-mount Sony G Master, or GM, lenses fits the bill for full-frame Sony a7 shooters, bringing with them first-class optical construction and a large number of elements to squeeze as much out of the sensor as possible. In terms of the Sony FE 70-200mm f/2.8, it’s not only the sharpest and best low-light zoom lens we’ve tested for the a7R II, it also outperforms many FE-mount prime lens options, ranking as the fourth-sharpest lens we’ve tested on the a7R II. Resolution at f/2.8 is first-class between 100 and 200mm, and peak sharpness of over 80% acutance in the field occurs between f/4 and f/8 for phenomenally sharp results on the a7R II. Costing $2,498 and coming in at 200mm in length, and weighing nearly 1.5 kg, it’s a big beast for the diminutive a7 series of mirrorless hybrid cameras. This ssaid, it packs plenty of high-end pro features for advanced autofocus operation, image stabilization, and all-round top performance in fast-paced environments. For greater insight into the performance of alternatives to the Sony FE 70-200mm f/2.8, please see our A7R II best prime lens review, as well as our in-depth Sony FE 70-200mm F4 G OSS, Sony FE 70-300mm F/4.5 5.6 G OSS and Sony FE 24-240mm f3.5-6.3 OSS lens reviews.